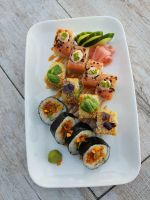 The Drift Ocean Terrace Lounge presents Sushi Night. Tamirah from BeyondSushiBarbados comes to Drift to serve some of her amazing sushi rolls. Sushi will be served from 6pm - 9pm. Drift overlooks the beautiful west coast.